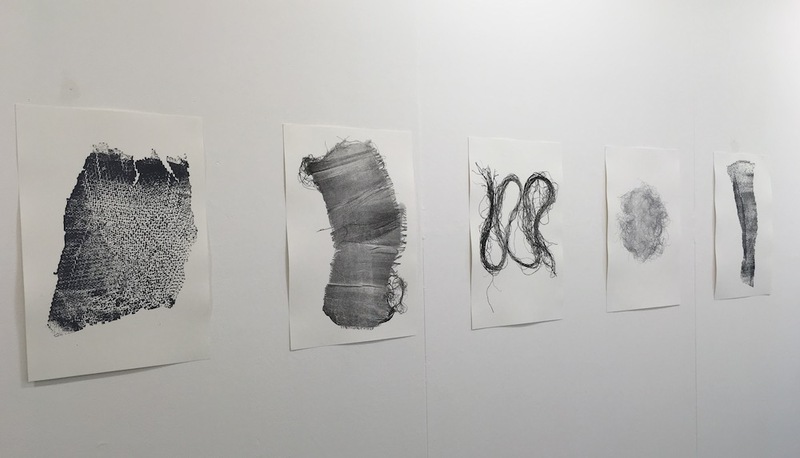 Our guest blogger, and MA Drawing student Caroline Holt-Wilson presents Unframed, an exhibition running alongside the MA Summer Show. Following last night’s private view, Unframed is open Friday 8 and Saturday 9 September, and by appointment until Thursday 14 September. “The central theme of the exhibition work made in response to drawings we had chosen to view on a visit to the study room at the British Museum. There is a comprehensive online catalogue from which we made our choices. The study rooms can be visited by anyone by appointment with Isabel Seligman from the BM Bridget Riley Foundation Project at the British Museum. It was an exciting visit. The study room is a dimly lit historic panelled room lined high with boxes of drawings. On arrival we found our pre-selected sketches ready to view placed on upright wooden desks. We had picked works by several Renaissance artists including, of course, Leonardo, but beautiful sketches and workings by such varied artists as Paula Rego, Bridget Riley, Rodin, Augustus John, Canaletto and Joan Eardley were also represented. We felt privileged to be able to examine these at such close quarters and be there long enough to draw from them. The works for Unframed were were not selected by the curators, so the challenge was to successfully integrate the paintings with the drawings. We did this by anchoring the walls with sizable works or pieces of strong colour, and distancing them from one another; the smaller works seemed to fall into place between them, the spacious room allowing clear space between each artist’s work. Because the space is large we chose to hang all the work at the same height, and, at a uniform height, each work displays a postcard-sized image of the original British Museum drawing with an explanation as to how the artist arrived at their conclusion. Caroline Holt-Wilson, MA Drawing Wimbledon College of Arts. For more information about Unframed visit the event page.